This was a great activity for my 2 year old son which at first engaged him for 40 minutes straight. 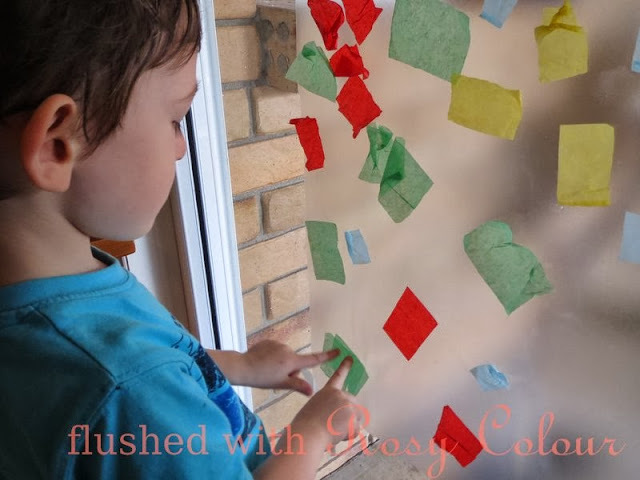 This is a fairly common idea you can find on the net, here is a blog that had this idea in a list of 70 fine motor activities for toddlers where the sticky collage idea is a fairly long way down the list. I prepared the small squares of recycled tissue paper the day before when Thomas was at day-care, I just used wrapping tissue paper I had saved from receiving gifts, I didn't buy the tissue paper. I ordered the contact from coles online and cut it into 3 pieces so we'll be able to repeat this activity on another day. I'll leave the contact up on the window for a few days I think so he can go back to it if he wishes. 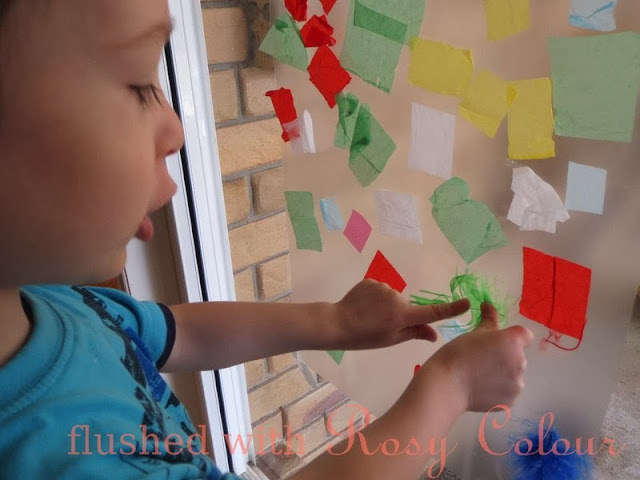 This was a very rich language activity for Thomas, by talking about the colours, and saying things like 'put it here' and 'its sticky! Thats funny!' while poking the contact with his finger and removing it quickly to make a popping sound. 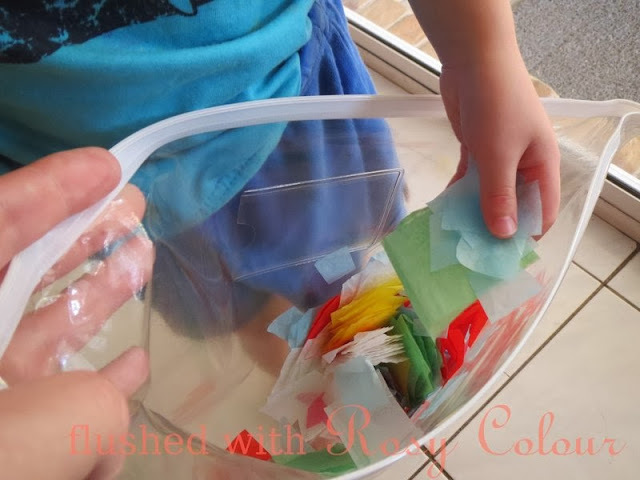 I kept the squares of tissue paper in a large plastic envelope and Thomas loved playing with that, digging into the pile of paper with his hands. "I think you like the sound" I said, then he quickly went back to the contact again and said "sticky sound". 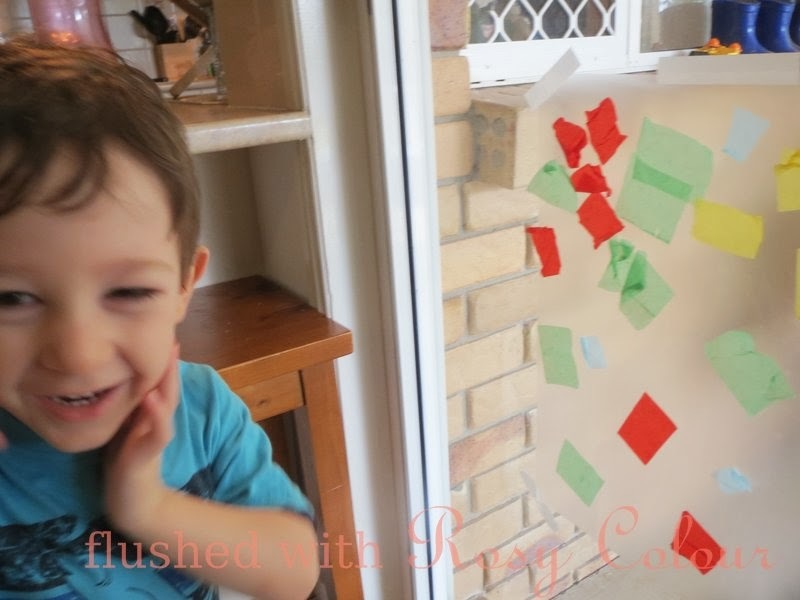 This was also a good fine motor activity as he was enjoying scrunching the paper between his fingers and sticking them onto the contact. He threw a pile of tissue paper onto the floor a couple of times, and when he picked up the tissue paper he scrunched up the pieces tightly in his hand. Thomas squealed with delight when I brought out the feathers in another big plastic envelop but they didn't make a nice crunchy sound like the tissue paper, I guess that's why he wanted to play with the tissue paper again pretty quickly. He stuck a couple of feather on, took them off, stuck them on again. Then he started ripping off the tissue paper delighting in the sound of the "rip!" Right now he is banging on pots and pans in the kitchen, a musician in the making!